This Gluten-Free Vegan Apple Crisp (Apple Crumble) is tender and juicy, crispy and chewy, perfectly spiced and tastes like caramel. It’s the best comforting dessert that can be enjoyed hot or cold. Start by making the apples. Heat up the coconut oil in a pan and add the coconut sugar. Cook for about a minute until coconut sugar has melted. Tip: Watch it carefully so it doesn’t burn. Add the plant-based milk, apples, vanilla, cinnamon and salt. Leave to cook on a low heat, stirring occasionally, for about 10 minutes until slightly softened – it doesn’t matter if not completely cooked. Add the tapioca starch and heat for about a minute until thickened. Whizz until you get a fairly smooth and firm dough. Place the cooked apple mixture in a baking dish. Use your fingers to crumble the topping over the top until it is all used up and the apples are completely covered. Top with chopped pecan nuts, if desired. Bake in the oven for 20 minutes, or until golden brown and crispy. for an oil-free option, omit the coconut oil from the apples and substitute the coconut oil in the crumble topping with nut butter such as almond butter or peanut butter. You can enjoy this Apple Crisp hot or cold. It tastes great with custard, ice cream or plant-based yogurt. This Gluten-Free Vegan Apple Crisp (Apple Crumble) is tender and juicy, crispy and chewy, perfectly spiced and tastes like caramel. 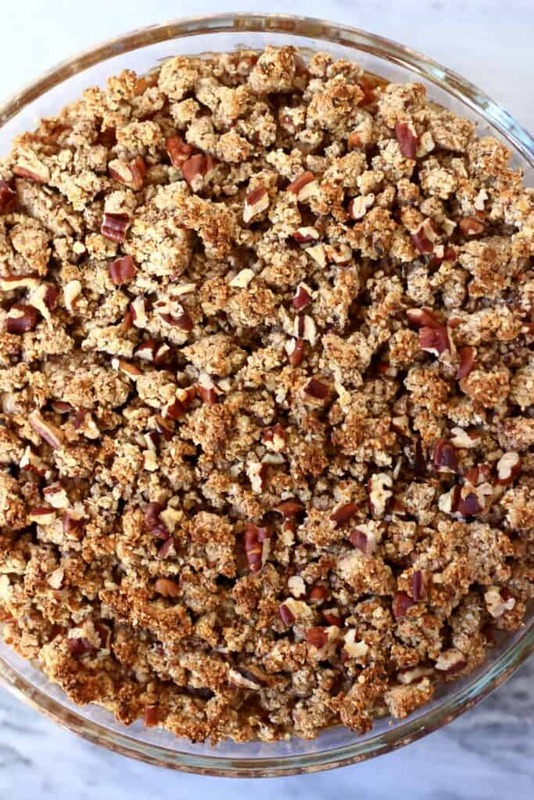 You can top it with any type of chopped nuts before baking: pecan nuts, walnuts, pistachios, desiccated coconut, flaked coconut etc. what size pie plate did you use? I used a 22.5cm/9inch one! I made this with my son at the weekend and we really enjoyed it. Lovely texture and just the right level of sweetness. Thank you! Yay thank you so much, so glad to hear you liked it!